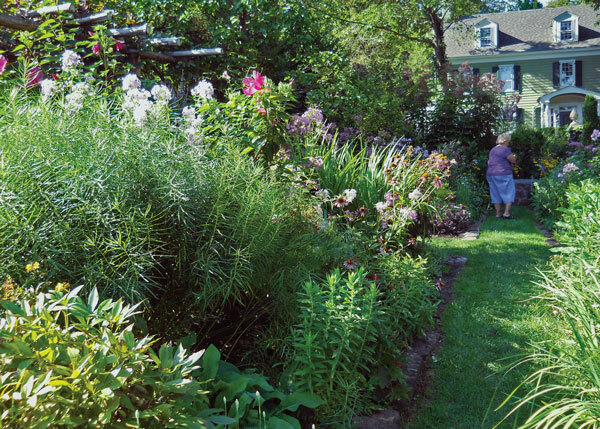 Plan to spend a day in the New Jersey Highlands on this easy path from garden to garden. Get to know the richness and pleasures of their natural and cultivated diversity. 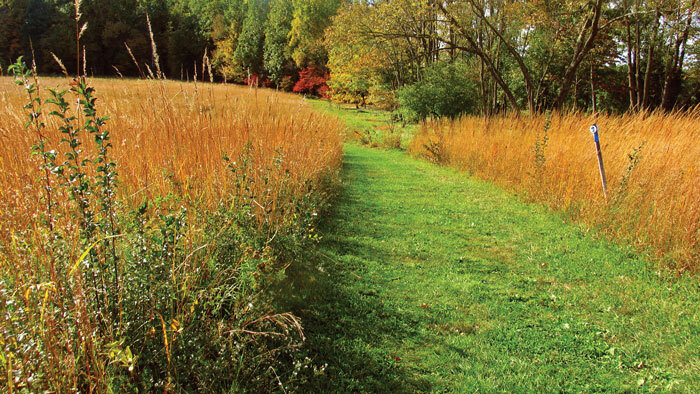 Pack a lunch and plan to spend a day on a leisurely walk along a western spur of Morris County’s Patriots’ Path, through meadows and woods and three glorious gardens. Take two cars and park one at Willowwood Arboretum (GPS address: 14 Longview Rd, Far Hills, 07931). 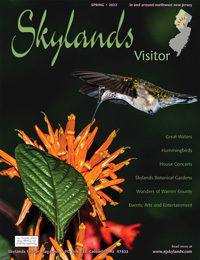 Drive the other north to Kay Environmental Center at 200 Pottersville Road in Chester Township. The walk runs north to south, west of State Highway 206. At Kay, take time to savor the meadows along the drive to the parking area. They are a lesson in habitat. There, birds, dragonflies and butterflies dart and flit around wild flowering plants and trees loaded with berries. To experience the Black River, take the Red Trail/Patriots’ Path via a grassy strip between woods and a field of goldenrod, thistle, little blue stem grass, dogbane with pods that resemble green beans, cherry trees and dogwood and young woods of juniper, black cherry and birch; early successional, sun-loving species. Watch for red blazes as you enter the woods. Follow them on a switchback as the path heads downhill along the river. On the descent, an older stand of trees is a study in contrast: smooth grey bark of American beech and chunky dark skin of black oak. This is a regenerating forest with seedlings of ash and maple-leaf viburnum covering the forest floor. 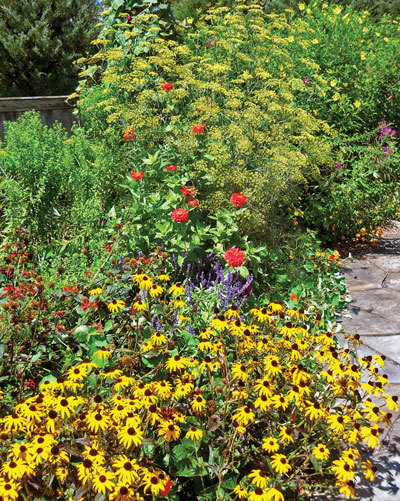 At the Bird & Butterfly Garden at Kay Center, fragrant cultivated flowers heavy with nectar and seeds, and the critters that enjoy them, greet the visitor. The moss-covered trail becomes garden-like with wildflowers, partridgeberry, ferns, mountain laurel and the sound of a waterfall. 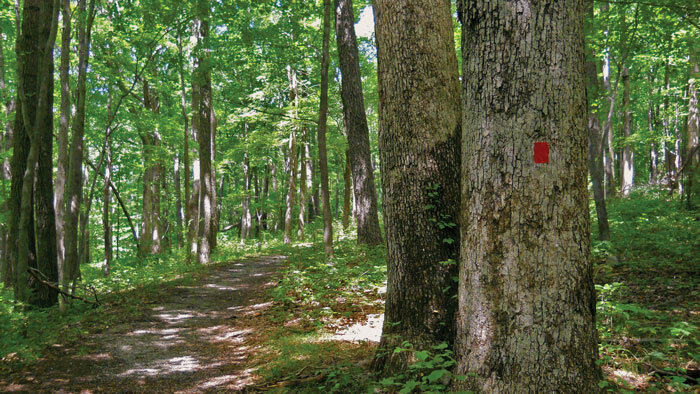 This part of the trail, also called Conifer Pass Trail, leads to a hemlock gorge once predominantly hemlock, “but many are now lost to the wooly adelgid,” says Mindy Schmitt, senior naturalist for Morris County Park Commission (MCPC). Through the trees, the river becomes louder, beckoning. Take a detour on a short footpath. The river is violent: raging, furious, swirling dark whirlpools among glacial boulders, some scooped and sculpted like bear dens. Soak it up. The footpath scrambles over trees, rocks, roots—a fun, typical Highlands trail—up into deciduous woods with thriving white pine seedlings, an unusual sight in New Jersey forests and a sign of a healthy one. This is a result of controlled deer hunts as part of MCPC’s Deer Management Program. Soon the river looks benign through soft leaves of hemlock and sunlit American beech. Many side trails lead to the river, now gentle and gurgling along. This is a sound to count sheep to in nature’s cathedral for the vexed in life. Like musical bass notes, the sound pulses to the heart. The path becomes rocky as it leaves the river. Glacial evidence abounds. Witchhazels make a floating bower over the path. At the top of the trail in a sunny gap, look for Hercules Club, a.k.a. Devil’s Walking Stick (Aralia spinosa), an East Coast native shrub that mimics sumac. It attracts birds, bees and butterflies but protects itself from larger pests, including humans, with hard thorns on leaves, trunk and branches. The path traverses woods on the Red Trail out of Kay Environmental Center and fields approaching Willowwood Arboretum. Cross Pottserville Road on the Red Trail/Patriots’ Path and head up into the woods. This must be a mast year for acorns and hickory nuts, which are all over the forest floor. The nuts being a preferred food for deer and turkey in certain times of year may, in turn, help increase their populations. A variety of mushrooms color the rocky footpath of boulders and eroded rock. The Red joins the Blue Trail that ambles downhill to the Bamboo Brook. There may be no deer eating seedlings here, but Japanese barberry, another forest destroyer, grows liberally along the trail. Research shows that Japanese barberry changes East Coast forest soil chemistry and structure to a soil type that is conducive to the fast growth of non-native invasive species and, in turn, inhibits the growth of slower growing native plants. With its barb-covered stems and its growth along paths where the sunlight is, it also assists the spread of Lyme disease by sheltering mice from predators. A towering stand of tulip poplar brings peace of mind, as do a few blooming wildflowers: aster, a delicate lavender pea-like flower, mint, boneset and one purple turtlehead. In these open woods, although a lone hawk sails from a treetop, the lack of birdsong is noticeable. “But not unusual,” says Kelli Kovacevic, MCPC superintendant of natural resources management. “Birds typically sing in spring and at dawn and dusk. Plus, these open woods have no understory that many songbirds require.” The future holds the promise of more song birds as the native shrub layer regenerates, thanks to the park commission’s deer management plan. Deer management has a trickle down effect that impacts the populations of many species in the forest food chain: the regrowth of shrubs, shelter and food for the variety of wildlife and insects that live in them and also their predators. The Bamboo Brook comes into view and rumbles alongside the trail. Take a sharp right to stay on the Blue Trail (beech leaves hide the blazes) that runs between the brook and an old stone wall. Cross Lamerson Road into different woodsy territory with a dense shrub layer, this one of invasives including bush honeysuckle. This area was farmland, and because of the land’s disturbance and exposure to sunlight, fast, weedy species thrived. “Those plants don’t offer the same things to wildlife that our native plants do,” Kovacevic explains. 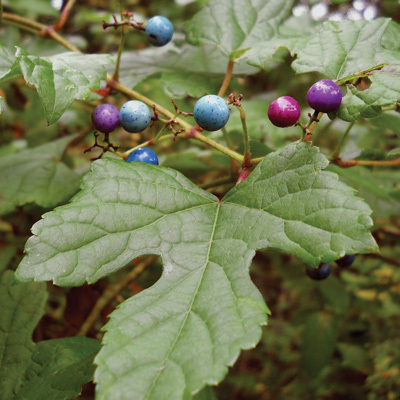 Fewer rocks, lighter soil, the “putt” of wild turkey, lots of deer runs, multi-flora rose and vines, including porcelain vine with metallic berries, exist in the confines of a now, tight path in thick woods. Tunnels of shrubs surround the trail, reminiscent of a storybook maze. If there is a scary spot on the trail, it’s here. Carry a stick and a boom box and play it loud. Soon arrive at Bamboo Brook Outdoor Education Center. 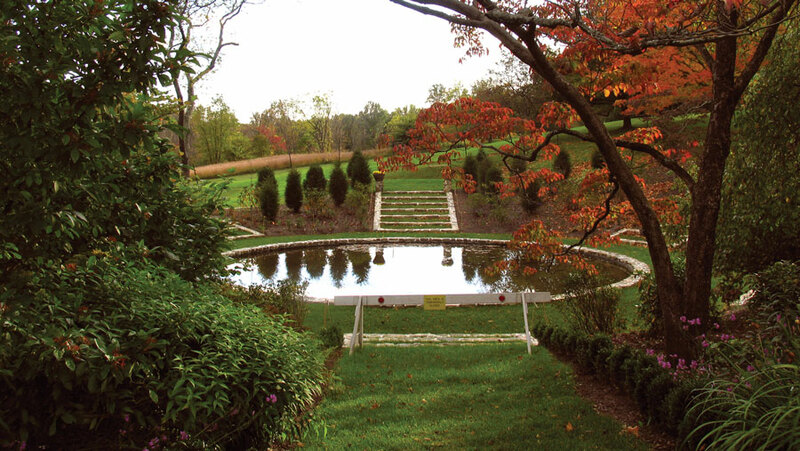 Take a few minutes for a self-guided tour through Bamboo Brook’s recently restored gardens, designed by Martha Brookes Hutcheson in the late 1920s. She was one of the country’s first female landscape architects and lived here until 1959. Go down the steps and head left around back of the house, past a stand of arborvitae full of golden berries. Several pathways wind through the formal garden. One leads to a porch, then down stone steps flanked by roses, garden phlox and cardinal flower among the shrubbery. There is much to inspect: garden beds galore with bottlebrush buckeye, massive forsythia and tall Goatsbeard, old tennis courts, stone pillars/ruins and more gardens further back. Luminescent pink obedience plant (Physotegia) is quite beautiful. Formal clipped hedges and boxwood edge beds of magnolia, perennials, ferns, rhododendron and an incredible dogwood. Down to the circular pond with six sets of wide stone steps with grass between. Up and across a grass-covered bridge over a stream planted with blue lobelia, cardinal flower and ferns. It smells good here— fresh, fragrant, almost like vanilla pine— on the way to the Little House, Hutcheson’s daughter’s playhouse. The stream flows under the house and out the back into small pools. Back uphill, a huge stand of Joe-Pye weed attracts swarms of swallowtails. Frogs squeak and jump. At the gravel road, turn left past the barns. Go through the gate and left onto the Blue Trail/Patriots’ Path into a sun-warmed and scented meadow to Willowwood Arboretum. Specimen trees are left standing to grow to their potential in fields of grasses, goldenrod, Queen Anne’s lace, sumac, little blue stem and mountain mint. The meadows are managed to provide habitat for birds, to encourage the re-growth of native plants and to destroy invasive populations. These meadows and those at Kay were once mowed annually, but the Commission is now experimenting with controlled burns in the dormant season (early December) to minimize the effect on wildlife, Kovacevic says. The trail runs over the Bamboo Brook, then up into meadow again: asters, goldenrods, switch grass, flying grasshoppers and blue bird houses. Soon the deer exclusion fence and gate to Willowwood appears. Tulip tree seedlings struggle through lance-leaved and rough-stemmed goldenrod, spotted knapweed and tall grasses. Cross a dirt road and enter the orchard, leaving Patriots’ Path behind. Turn right on the Red Trail. Here, scarlet oak begins to turn red; its lower branches turned down like pin oak. The trees are divine: cutleaf crab is a champion and shagbark hickory shows like it’s never been seen before. Cottage garden and Tubbs House at Willowwood Arboretum. Borders of yew, a sprawling purple beech and blooming autumn crocus lead to the 1792 house and English-style cottage garden. Open the wrought iron gate and enter with the scent of Harie Parie rose and boxwood sentinels that rise among roses, Japanese anemones and summer’s seeds. Iris leaves and gigantic swoons of European Marsh Gladiolus splash the edges of beds. A rough-hewn pergola stands amid Montauk daisy, tiny pink and red roses, crusty verbena, cone flower seed heads and bright melampodium, red salvia and amaranth. An orange-flowered vine floats around a spiky ball of grass and furry maroon flowers. Abundance and decay—life and death— are everywhere in this garden at summer’s end. Striking color combinations abound: tall purple straw flowers and purple beans in a quiet corner, a pot of almost-black colocasia under a cherry tree with chartreuse hosta and magenta coleus, bright red and black berries of fernleaf peony with witch hazel, a plant for every back yard. Behind the house in planted woods, Japanese maples create a restful spot that seeps through your skin. It’s a shade garden under dawn redwood (or bald cypress), filigreed maples and chartreuse ferns alongside a quiet lily pond. Hike with a companion or tell someone where you are going. Always trust the blazes. Never turn off the trail unless you keep your trail in sight or if a blaze tells you to do so. When you see a double blaze, the trail turn in the direction of the top blaze. If you think you lost the trail, stop and look behind you for a blaze. Walk back the way you came until you see one. Wear blaze orange during hunting season: October through February. No dogs are allowed in the gardens. Maps and information are available at the Morris County Park Commission website. Mary Jasch is publisher of DIG IT!, a regional gardening magazine.